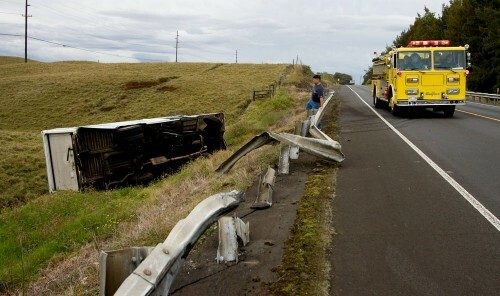 A large food service truck overturned alongside Highway 19 on the Mauna Kea side just west of Waimea Country Club Thursday morning. The hazardous materials unit as well as an engine and medic unit arrived on scene shortly after 9 a.m. according to the Fire Department. 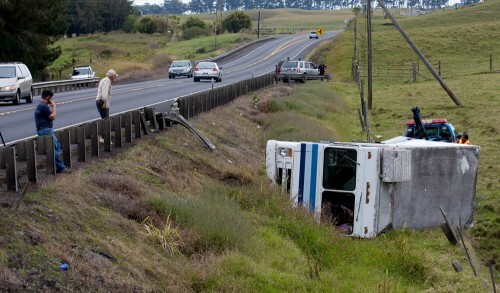 Miles Saito, left, owner of the Earl's Snack Shop truck which overturned alongside Highway 19 just west of Waimea Country Club. Don Winters, center, is the pasture owner where the truck rolled down the embankment. Ted Alip, right, uses a winch on his tow truck to right the vehicle. The highway was closed due to a possible gasoline spill and propane tanks on board. The driver of the vehicle was slightly injured in the accident. Fire crews left the scene at about 11 a.m. and police opened both lanes of traffic shortly after that.